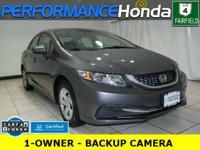 Honda Certified, CARFAX 1-Owner, ONLY 34,508 Miles! LX trim, Dyno Blue Pearl exterior and Gray interior. Bluetooth, CD Player, Back-Up Camera, iPod/MP3 Input. AND MORE! Back-Up Camera, iPod/MP3 Input, Bluetooth, CD Player MP3 Player, Remote Trunk Release, Keyless Entry, Steering Wheel Controls, Child Safety Locks. 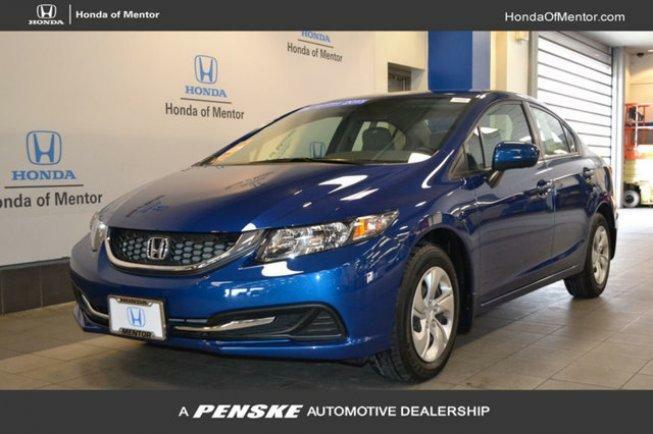 Honda LX with Dyno Blue Pearl exterior and Gray interior features a 4 Cylinder Engine with 143 HP at 6500 RPM*. ". the rear-seat accommodations are excellent for this class. The rear bench is mounted high enough to provide proper thigh support for adults, and it boasts significantly more real-world legroom than key rivals like the Chevrolet Cruze and Ford Focus." -Edmunds.com. Pricing analysis performed on 5/5/2018. Horsepower calculations based on trim engine configuration. Please confirm the accuracy of the included equipment by calling us prior to purchase.